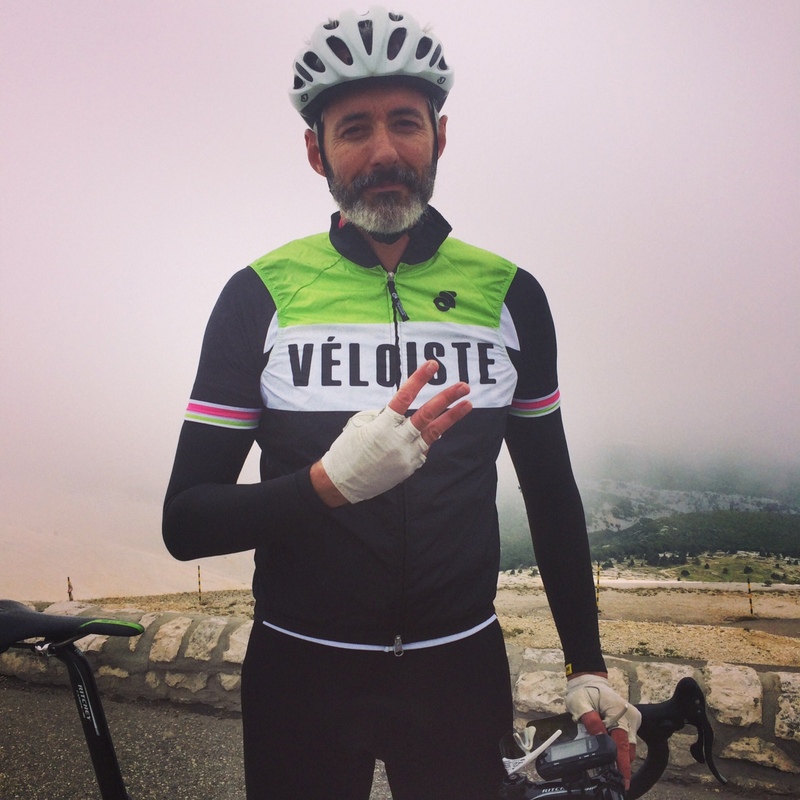 I never thought that cycling up Mont Ventoux three times in a day was going to be easy. After all, I’ve done it once before and that was difficult enough. But I’m not sure I really had any idea about how tough it would actually be. In fact, I know I hadn’t. I’d have probably not bothered trying. This could be a very long post, because it was a very long day. I’ll try and keep it short(ish), but will fail. In summary, the mighty Mont Ventoux in Provence – the giant mountain that has featured Tour de France battles aplenty and taken the life of British pro cyclist Tom Simpson – has three paved roads all the way up to its summit at 1,912m high. Ride them all in one day and you get to join the Club des Cinglés. It’s a ride that in total measures 136km along but, significantly, includes 4,443m of vertical ascent. 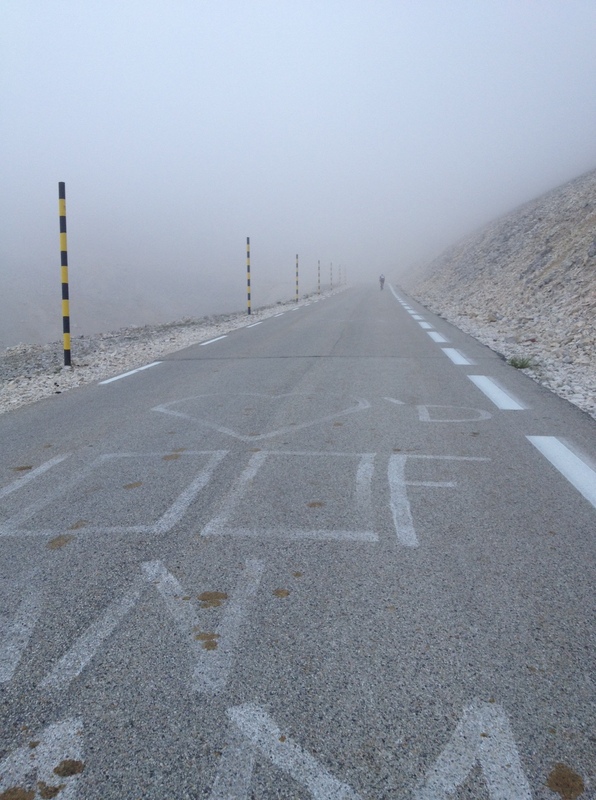 Throw in the unpredictability of Mont Ventoux’s weather and it’s a recipe for, well, a decent story at least. 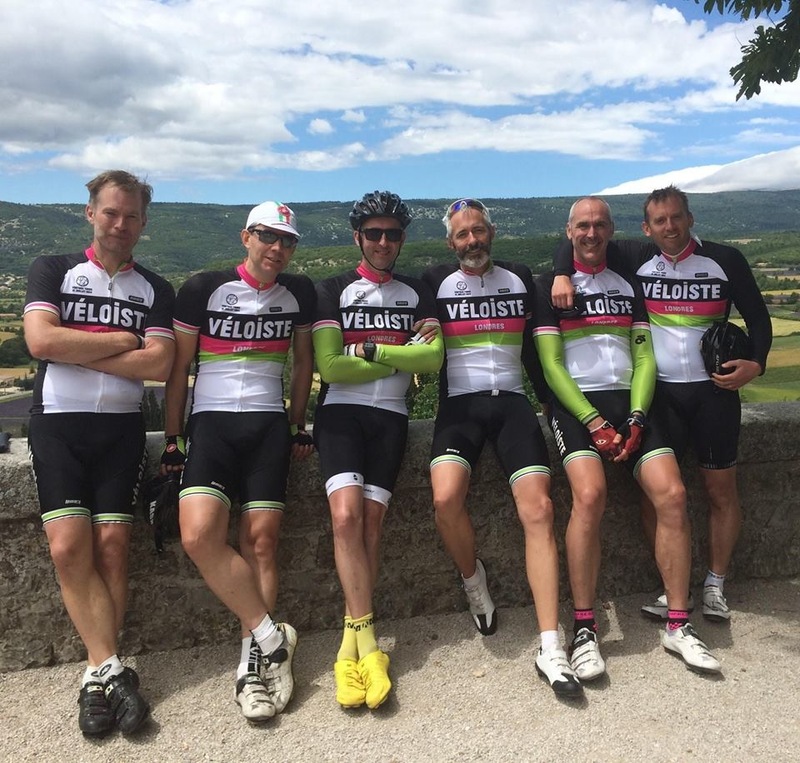 I was joined by five good men of Les Veloistes Gentils: Matt, Mark, Beev, Typo and Jon. We were riding in the memory of good friends and fellow LVGs, Tim and Nuts. You can find that back-story here on my Just Giving page. So, here we go. We started in Bedoin, and we started early. Bedoin, because that route up is known as the most difficult and we fancied getting it out of the way first, and early, because (a) it’s the middle of July and not unlikely to be roasting hot by mid-morning and (b) we thought we might need every hour of daylight available! 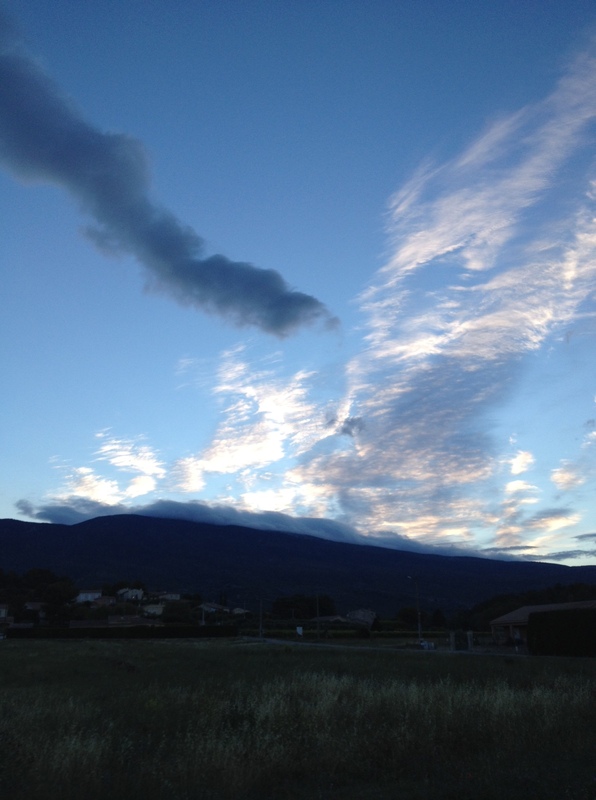 So, at a shade after 6.00am we got our cards stamped at the machine outside Office de Tourisme and set off on what was a beautiful morning, though with the summit of Ventoux slightly worryingly obscured by a big dollop of cloud. The route to the summit from Bedoin is the one a few of us had done before and which is probably the best-known, being the traditional route used by the Tour de France. Essentially, it’s a gentle roll out of Bedoin for about 6km before a sharp turn into the forest where the road kicks up sharply for a very tough 8km until the large sweeping turn at Chalet Reynard and the final famous moonscape of Ventoux’s upper slopes for the final 6km run to the summit. I’ve made that sound easier than it is. Basically it’s 21km uphill and some of it is very steep. But knowing that the climb was the first of three that day meant that we all tried to keep well within our limits (not that it felt it, to be honest) and it was relatively straightforward. ‘Relatively’ because about 3km from the summit the cloud closed in and it got pretty damn cold. And the last kilometre feels long and very steep when you can’t see the top. Still, we all got there. Being just after 8.00am the shop wasn’t open and there was nobody around (in fact we’d had the mountain to ourselves) so none of us was hanging around and we dropped over the other side for the glorious (but again, pretty cold) descent into Malaucène to get our cards stamped and to down much-needed hot chocolates (weird for mid-July in Provence to be honest). But that’s what we did. And it was very, very hard. There are 3km in the middle of the climb back to the summit which nearly did for me. I had to have a serious word with myself. There the ones that are 11, 10 and nine kilometres from the summit. And, respectively, they’re 12%, 11% and 11%. That’s tough going. So tough, in fact, that when I saw that the marker for 9km to the summit and that its average gradient was only (only!) 8%, I very nearly cried with joy. I’m not joking. The cloud still obscured the summit of Ventoux, but ascent number two was in the bag not too long afterwards (just after noon if you’re keeping tabs). The shop was open this time and I had a Coke and a Snickers, which were very nearly the best things I have ever eaten. We bombed down to Chalet Reynard and took the fork towards Sault, which is a fantastic road. In comparison to the route from Chalet Reynard to Bedoin, the Sault road is shallower and more sweeping. It’s also got a brand new super-smooth surface. You fly through the forest and come out to ride across the valley floor through lavender fields (where you might, as I did, have a head-on collision with a bee which then stings you on the bridge of your nose) and up a little 1km 5% kicker to Sault. But no matter…you’re 2/3 of the way there and lunch beckons! I’ve had rides before where I’ve reached lunch absolutely famished and made the huge error of stuffing myself so full that the afternoon’s riding has felt dreadful. Determined not to make the same mistake on this trip, I only polished off half the very welcome spag bol and half the equally welcome doughnut Beev bought us all. Cards stamped we found someone to take this happy picture and we were off yet again. The ascent to the summit from Sault is regarded as the easiest (if that’s the right word). You start at a higher altitude so with it being long at 25km, the average gradient is less. And with the top 6km being the same steep ones that you cover on the run from Bedoin, the first 19km or so from Sault are, in relative terms, pretty pleasant. In fact with a tailwind and the lovely surface, we covered the last few into Chalet Reynard at an average of 30 km/h. Nice. We gathered and decided to stay together for the final run up to the summit. 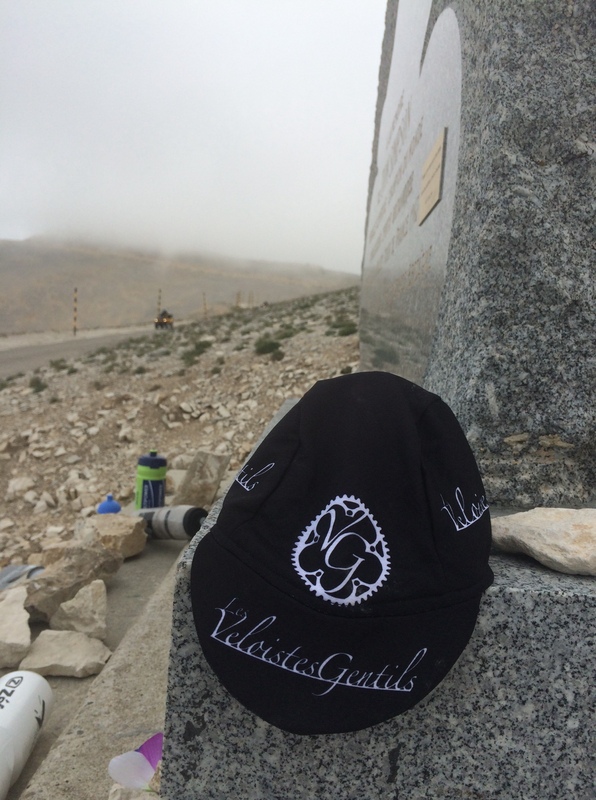 We also decided that we’d stop at the memorial to Tom Simpson for a moment’s reflection and to pay our respects to Tim and Nuts, which we did by leaving one of the original LVG caps which Tim had designed. After that it was just the long last kilometre up to the (still cloudy top). Quick photos and hugs and then a very fast descent all the way into Bedoin for the final stamp. It’s amazing the turn of speed the promise of a pint can give you, even with three trips up Ventoux in the legs. As it happens and just for the record, in the sprint for the Bedoin sign I pipped Jon. So, effectively, I won. So, that was that. We got back to Bedoin more than 11 hours after we left, and had been in the saddle for nearly nine hours of that. Which is why my bum was sore. I won’t be hurrying back to Mont Ventoux. But I do love the place.